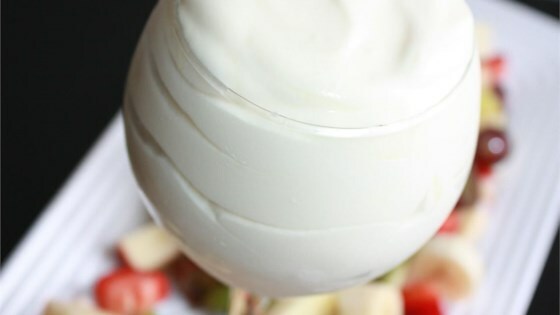 "This is a fruit dip that's very easy! Blend your favorite yogurt flavor with frozen whipped topping and dip! I use slices of Granny Smith, Golden and Red delicious apples, white & red grapes, orange sections, strawberries, kiwi fruit and pineapple chunks for a platter. " In a medium bowl, blend the whipped topping and yogurt. Chill in the refrigerator 30 minutes before serving. FINALLY!!!!!! A good recipe that doesn't take marshmallow creme (which I hate). This is so fast and easy and super-good! Thanks for sharing. I took the advice of some others and used 2(8 ounce)containers of Strawberry Banana yogurt. Everyone loved this recipe. Will definitely make this again! !